January has arrived and with it has come our resolution to eat a little bit healthier in 2019. To help make this aim a reality, we’ve come up with a list of snacks to keep your energy up while you’re on the go. We’ve included some snack-time staples as well as ones you might not have thought of before, judging each one on its content (protein, carbohydrates, vitamins, minerals etc.) and on its overall taste and texture. So sit back, grab a bag of crickets (you’ll understand why later) and browse our rundown of wholesome nibbles you can enjoy on the go. Yes, you read that right. This is a bag of smokey barbecue-flavoured crickets. While they might not be the first thing that comes to mind when thinking of healthy snacks, these critters are packed full of protein and are tasty to boot. If you can get over the initial mental block, the tangy barbecue flavour complements the herby undertone the crickets carry. Along with their nutritional benefits, crickets are sustainable to produce as they require a fraction of the land needed to rear conventional livestock. This is a snack that rewards your body and your conscious. This curly, crunchy snack is the most moreish of the nibbles on our list and at 77 calories per serving (20g), you won’t feel as guilty for it. The barbecue flavour has the perfect balance of sharp lemon and rich paprika, and the popped pea curls are as light as they are filling. Yellow peas are packed full of protein and complex carbohydrates, which act as a slow energy releaser to keep you moving throughout the day. We would recommend dipping them in hummus for a real treat. 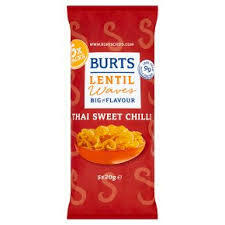 This big bag has five 20g packets of the lentil-based snack inside, making it great value for money. And with one containing 2.3g of protein and the lentils naturally containing B vitamins, magnesium, zinc and potassium, they’re packed full of beneficial nutrients. There’s no added MSG, artificial colours or flavours either. And we think they’re delicious – the Thai sweet chilli flavour contains a mix of ginger, fragrant lemongrass and spicy chilli. Suitable for vegans and vegetarians, too. From food blogger and cookbook author Ella Woodward comes this little snack that packs a big punch. 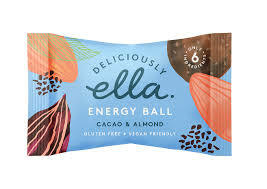 Each ball contains only six ingredients: dates, almonds, cacao, coconut oil, almond butter and a pinch of salt. Cacao is the seed used to make cocoa but, as it hasn’t been chemically processed, it retains all the antioxidants that would otherwise be lost. Plus, this Amazonian superfood is packed full of iron. t’s very, very bitter though, taking the flavour of a strong dark chocolate, so do bear that in mind if you’re looking to eat your snacks quickly. 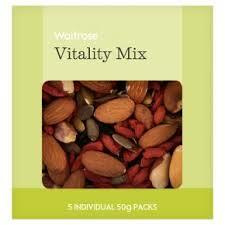 But otherwise, it’s a tasty and filling snack – great for a mid-morning boost at your desk. Suitable for vegans and gluten-free. This easy-to-store box contains five small bags of almonds, brazil nuts, pumpkin seeds, dried goji, dried blueberries and pistachio kernels. The mix of nuts is packed full of fibre, vitamins and healthy fats, and is a great lunch box alternative to chocolate and sweets. 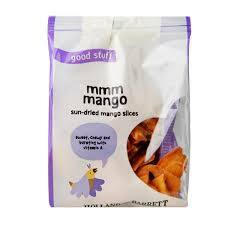 This bag of dried mango is ideal for anyone who gets an afternoon snack craving. Mango is packed full of vitamin A and C, which is used by the body to help keep skin and hair healthy. The texture of these slices is chewy, while the taste is slightly sweet, making it a great alternative to sugary snacks. The bag is a little hard to reseal though, so it’s worth investing in some reusable bag clips if you’re eating on the go. Garbonzo is a type of chickpea, which is full of fibre, and fibre helps lower cholesterol and promotes healthy digestion. 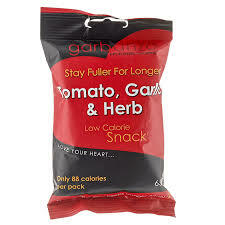 The tomato, garlic and herb flavours in this bag complement each other well, making this snack our number one for taste. Do be aware though that these chickpeas are really crunchy, so make quite a racket when eaten – perhaps not one for a quiet office. But they are a tasty, moreish snack to absentmindedly munch while watching TV. Gluten- and wheat-free. 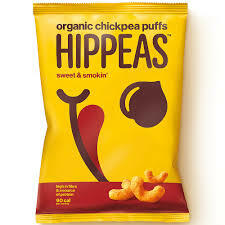 These puffed up chickpea snacks are great for picky eaters. The familiar shape tricks you into thinking you’re eating something deliciously bad for you. 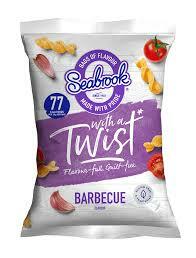 The crisps, however, are full of fibre – a great source of protein – and are dairy- and gluten-free. The flavour is generally quite sweet with a rich, smokey undertone and, at only 90kcal per serving, you won’t feel bad coming back for more. Suitable for vegans. This pocket-sized box of peach-flavoured pastilles will satisfy your sugar craving whenever it may hit. But the sweets are sugar-free, fat-free and, because of the acacia gum used to make them, are rich in fibre to promote heart and digestive health. They taste exactly like a peach melba and each small sweet can be chewed or sucked. They’re great for chucking in your handbag to have throughout the day but eating too many can have a laxative effect, so limit yourself to one serving a day (five sweets). These savoury straws are kale, tomato and spinach-flavoured and go well alongside a salad or sandwich for lunch. They are gluten-free, have reduced salt, no added sugar and suitable for vegans. Potato is the main ingredient, however, so expect a higher carbohydrate content than some of our other snacks on this list. 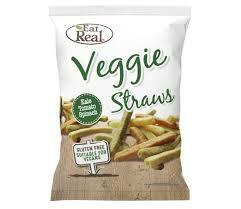 The straws come in a large 113g bag, making them a great snack to share with friends or colleagues. Liquorice has a high amount of flavonoids, which is a naturally occurring chemical that lowers excessive cholesterol in the body. And while this snack is high in sugar, liquorice is also said to ease common skin problems such as dermatitis and eczema. 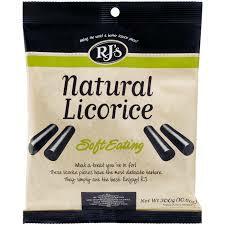 The natural sweets, made in New Zealand, melt in your mouth and are a great way to fulfil a sweets craving after a meal.